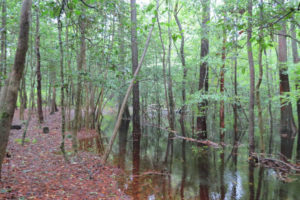 The Pocomoke River and connecting creeks and lowlands are flooded after days of heavy rain. It happened in the summer of 1989 and we thought that was the ’50 year flood’. Then my home and studio were isolated when damaged bridges all over Worcester County prevented access to many low areas. This year the bridges have mostly held but Rt 12 is impassable in several places not least at the Pocomoke River bridge going into Snow Hill. Water flowed over the Nassawango Creek bridge when I took this photograph but shortly afterwards the road was closed when the fast moving water damaged the road. In 1989 when the water flowed across the road there were river otters playing and sliding across the flooded road while the bridge was too badly damaged to allow traffic. 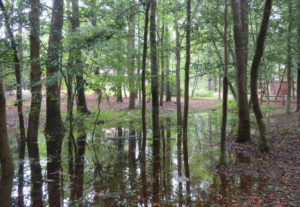 The land along the Pocomoke River and Nassawango and other creeks is a low swampy forest that absorbs rainfall overflow like a sponge. 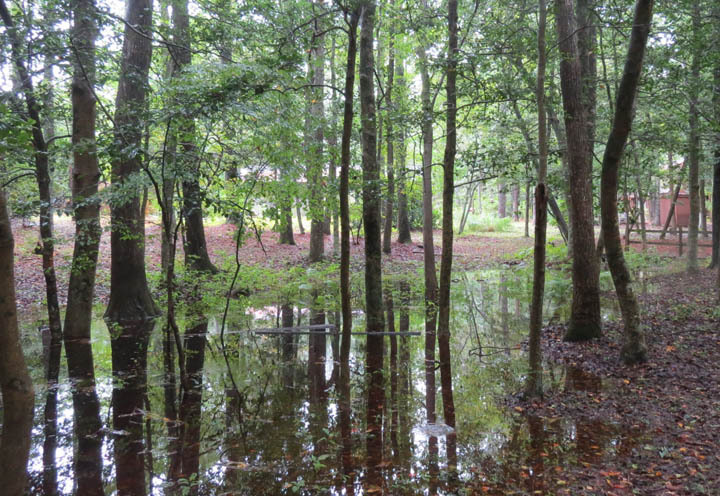 When the rains are too heavy and a saturated forest starts to flood it causes changes to the ecosystem here. 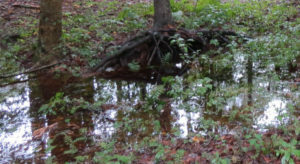 Deer, wild turkeys and even blacksnakes head for higher ground while shallow rooted trees like maples often fall even without wind. 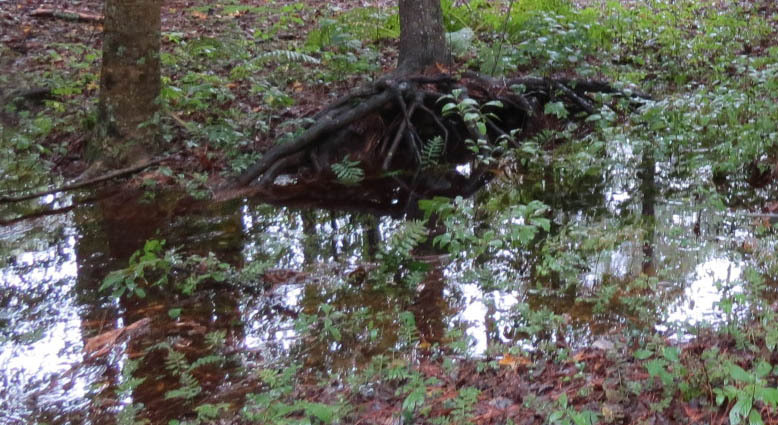 Maples often lean with roots exposed even in drier times. The Cypress trees, with their ‘knees’ are better anchored and the knees (growths from the roots) tend to grow only as high as the average high water mark. 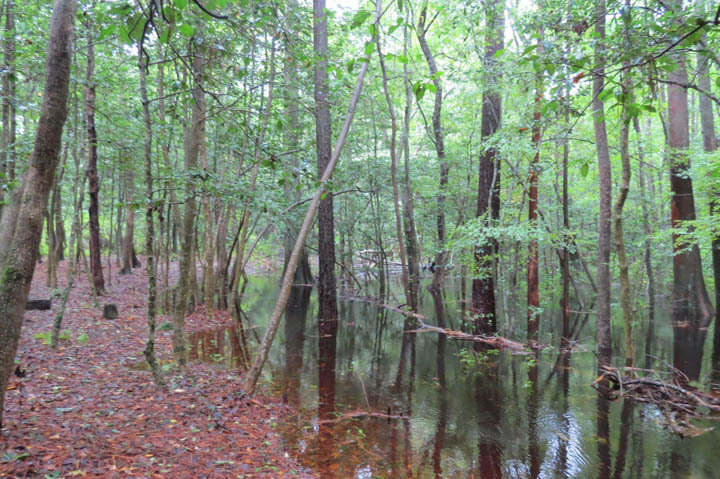 All of the excess water will slowly trickle through the flooded forests and into the creeks and Pocomoke River on the way to the Chesapeake Bay. On the way it will absorb tanic acids from the fallen leaves and cypress needles and turn a deep tea brown. The forest will also filter the water to a degree. Flooding here is part of the water system but it is not usually this dramatic. While we may be isolated while roadways are repaired, it is nothing to the inconveniences that would occur if we did not retain this valuable filtering swamp along the waterways. Sharon is the artist and naturalist who writes Woodland Seasons. An artist, illustrator, author and designer, Sharon Himes has long been an avid naturalist exploring and learning about the flora and fauna of the woodlands near Snow Hill on Maryland’s Eastern Shore.